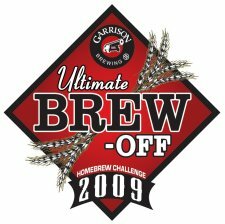 Welcome to the first annual “Garrison Ultimate Brew-Off”, an annual competition for hot-shot home-brewers across the Maritimes. Participants will be asked to produce a 5 gallon/20litre batch of beer based on a pre-determined beer style. Each entry will receive a written review with the top four each receiving a prize. The best beer overall will be scaled up to commercial size by our Brewmaster, Daniel Girard, which the home-brewer will assist in brewing as a Garrison seasonal! This is intended to be an annual event, with a different style chosen each year. * Beers must be within BJCP Style Guidelines to win. The 2009 style is “STANDARD / ORDINARY BITTER”. 2.) extract with hops &/or malt. * Registration deadline is April 30, 2009. Samples must be received by Tuesday, May 19, 2009. * All entries will receive a written evaluation (including suggestions if applicable) by our award-winning Brewmaster, Daniel Girard. * Awards will be handed out at a reception on Thursday May 28, 2009 at Garrison Brewery (1149 Marginal Road) and finalists are asked to bring a quantity of their brew for attendees to sample. * Prizes will also be given out for Silver, Bronze & Honourable Mention, including gift certificates from Noble Grape. ** Garrison retains the right to name & brew the finished product without royalty, compensation or limitation.